“An oil change is the cheapest insurance you can buy for your motor.” I have found myself saying this countless times over the years as it always holds true. 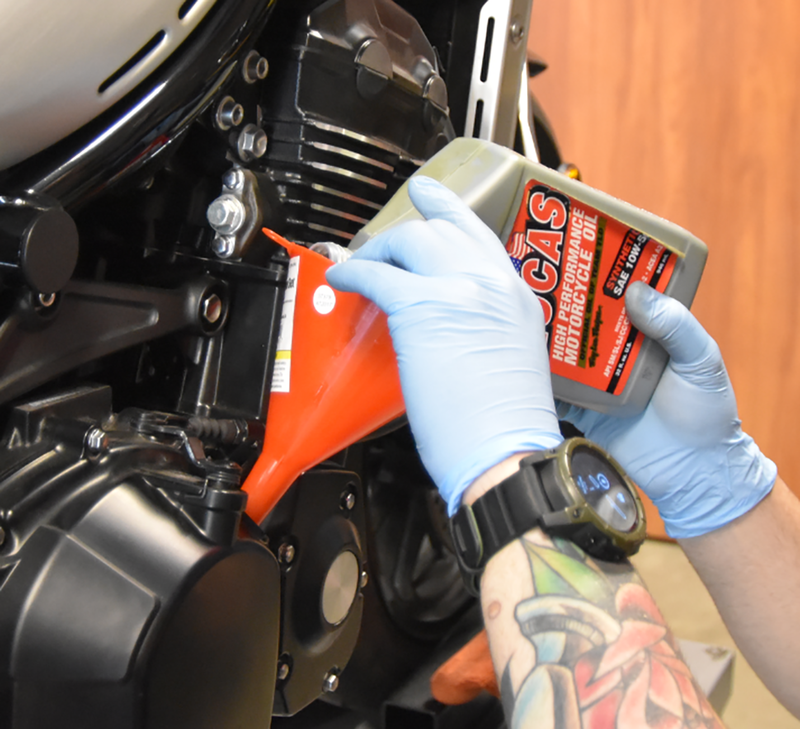 Engine oil is your motorcycle's lifeblood and will affect your engine's longevity and performance more than any other factor. 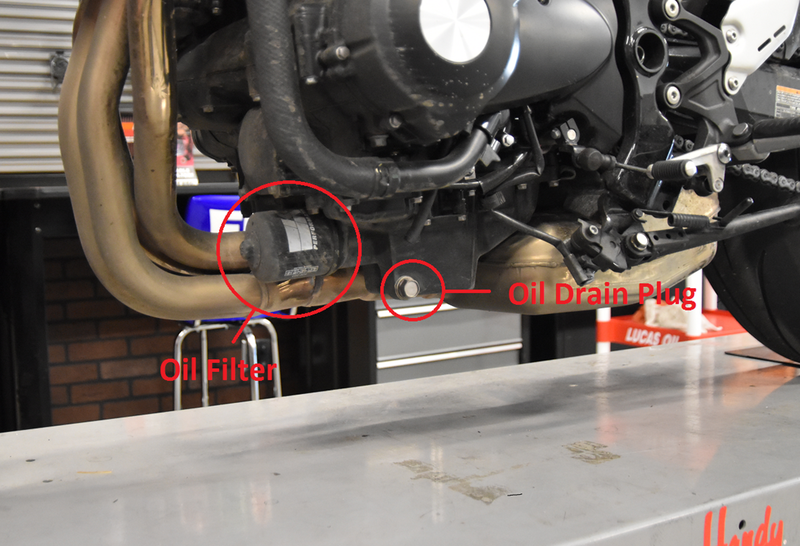 Let’s go over the what, why and how of oil types, filters and how to service them. 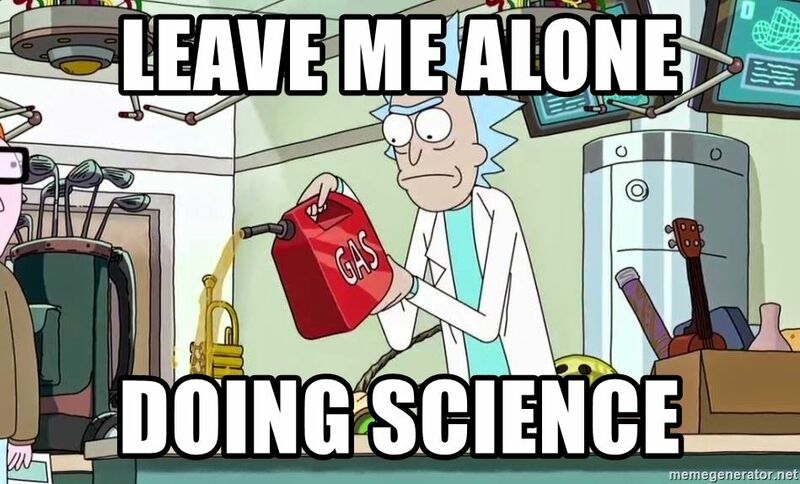 Engine oil. 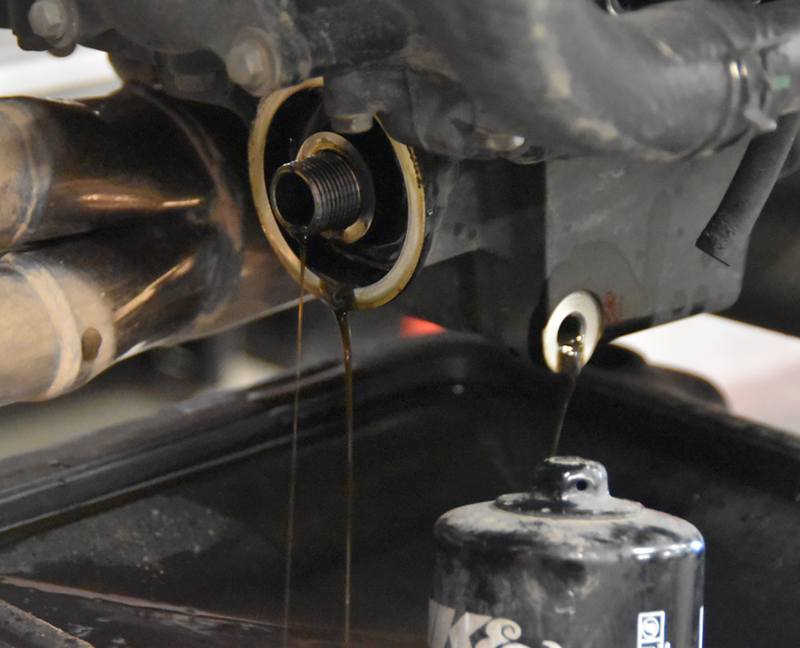 We all know that oil lubricates but it does much more: Engine oil helps keep internal temperatures down, clean vital components as it is carried throughout the engine, and reduce friction at engine start-up and sustained RPM. 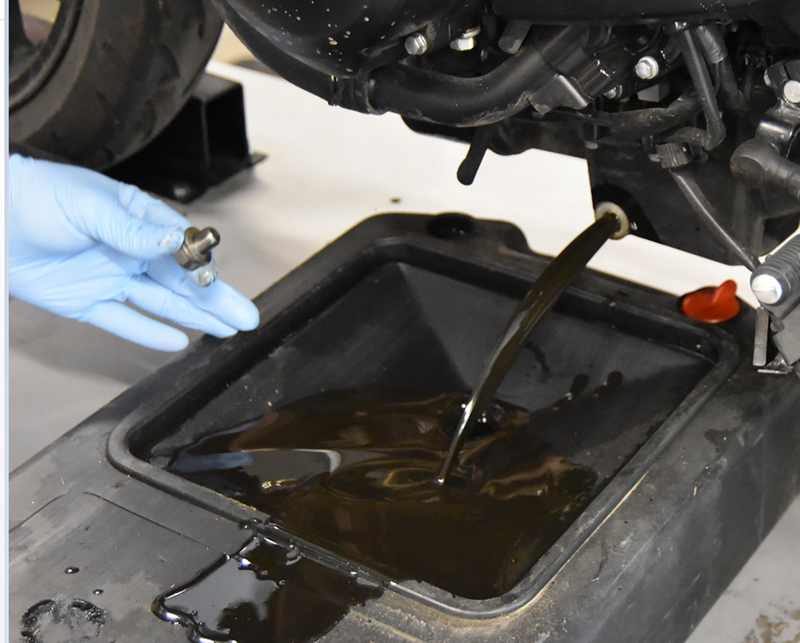 The topic of conventional, semi-blend and synthetic oil is long and dry, so in an effort to get you back to riding, let’s be quick and break it down to the basics. Conventional Oil: This is the oil used in bulk at dealerships and is the cheapest at the parts store, too. 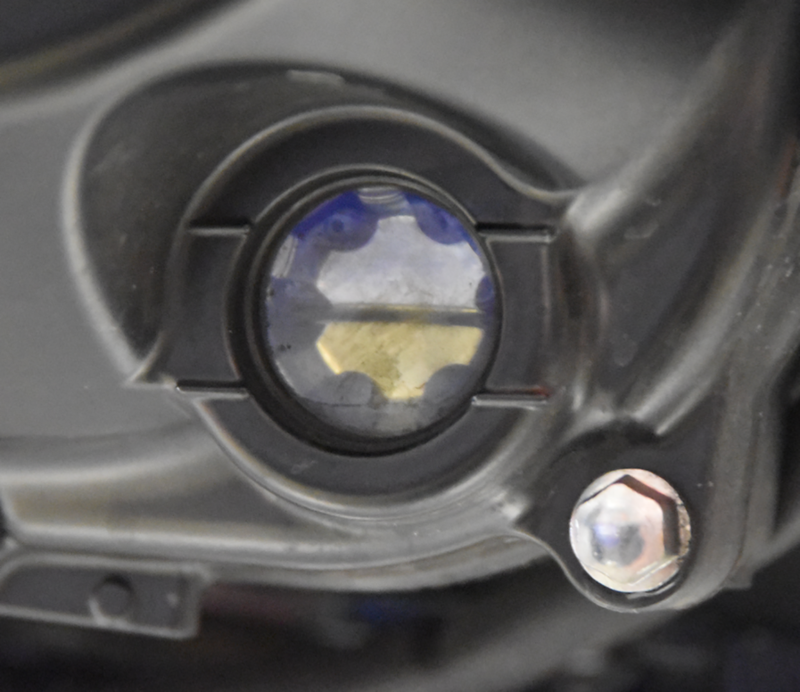 Most adhere to all motorcycle application standards but offer little in the way of additive packages. This is good oil for owners that are religious about frequent oil changes and have low-mile (but well broken-in) engines. Synthetic-blend Oil: This is essentially conventional oil hit with a dose of synthetic. 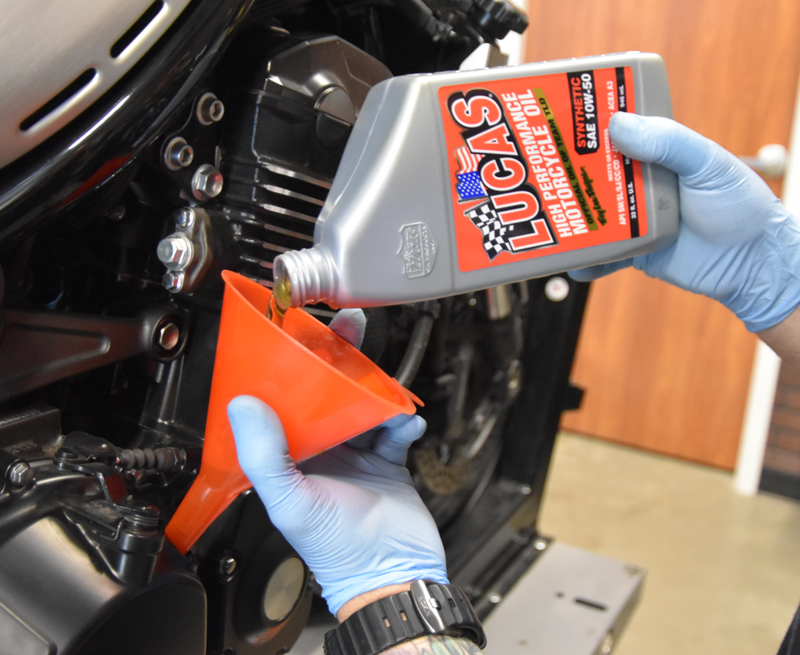 They’re formulated to offer better protection during heavier engine loads and the associated higher engine temperatures. Full-synthetic Oil: These oils are made for high-tech engines. If these oils pass stringent special tests (indicated by their labeling), it means they have superior, longer-lasting performance in all the critical areas – from viscosity index to protection against engine deposits. They flow better at low temperatures and maintain peak lubrication at high temperatures. While excellent oil, synthetics do cost more and are not required for all engine types. 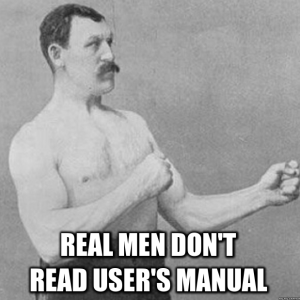 All said, REFER TO YOUR OWNER’S MANUAL. Your manual will have the information of oil type, weight and volume to use. 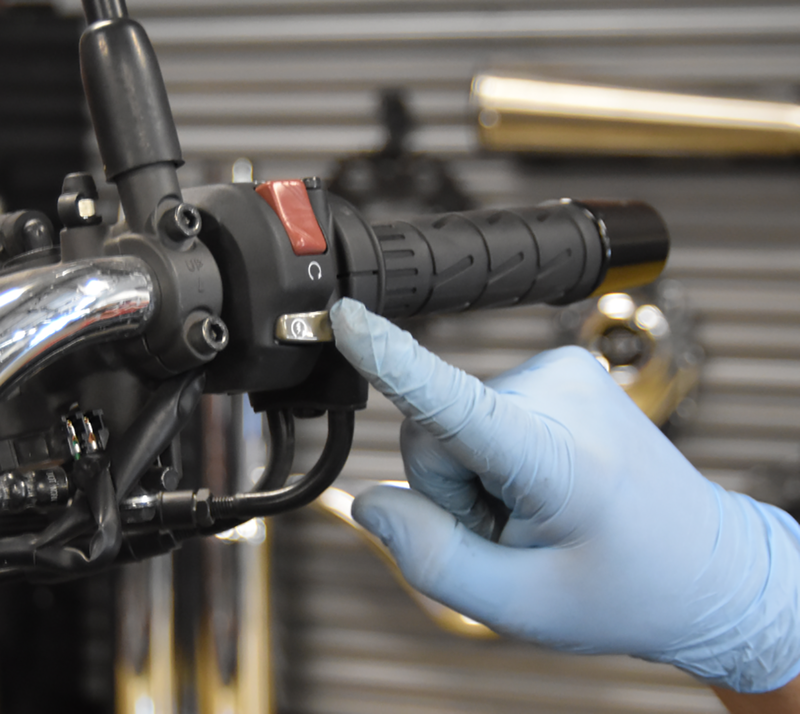 “Synthetic leaks in all bikes” - This isn’t true for most bikes, but may be for vintage applications as tolerances are not as tight. (Let’s be real, all old bikes leak). 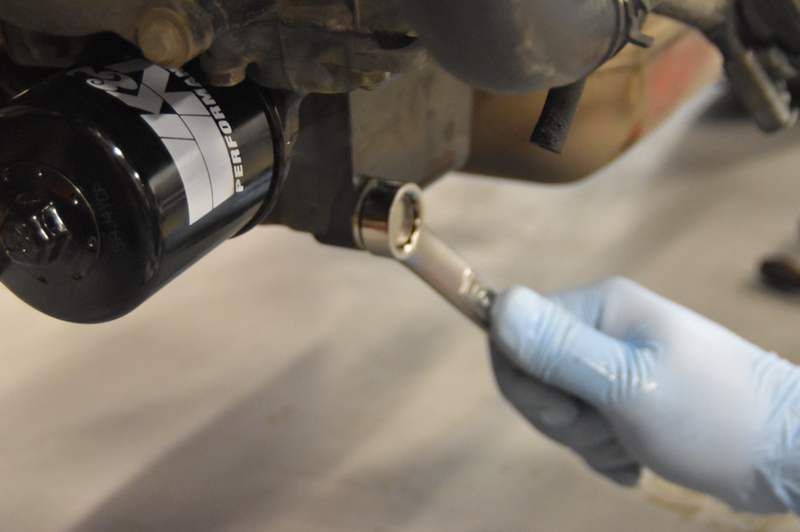 “My oil looks clean, so I don’t need to change it” - Oil breaks down with use and can absorb moisture and deliver harmful agents to your engine. 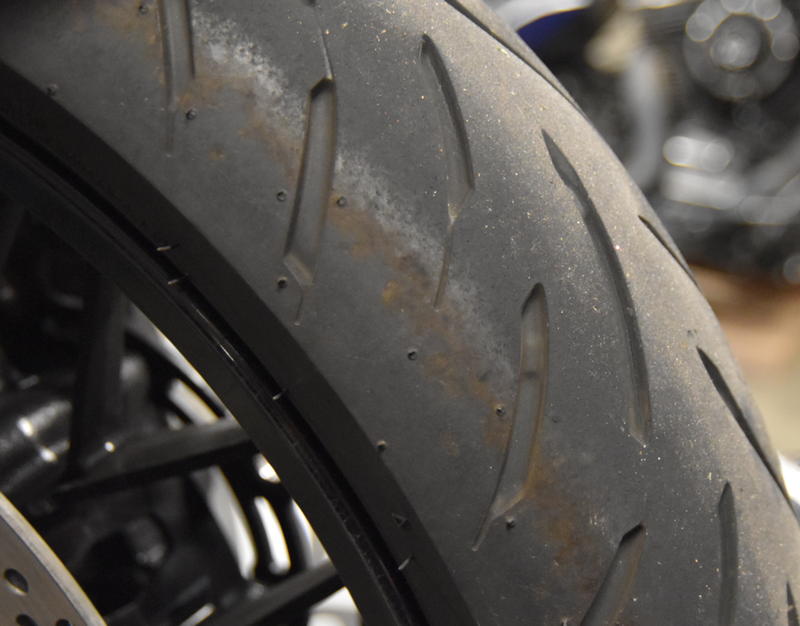 It is important to change your oil to the manufacturer’s recommendations or at least every riding season. “You cannot break in a new motor with full synthetic”- A lot of manufacturers ship brand new bikes with only synthetic in them. 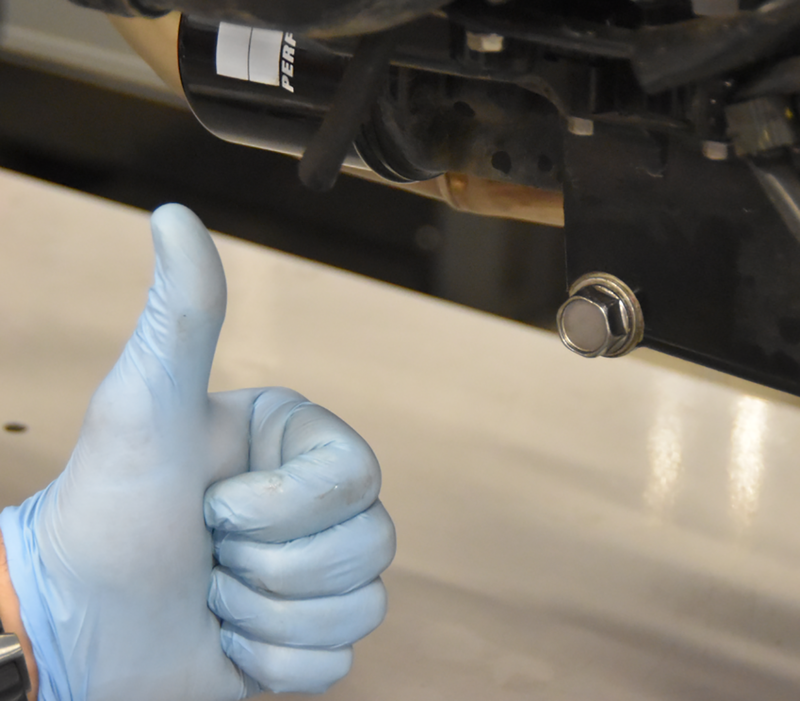 Tests have shown that synthetics do a great job at leaving a “film” layer over engine internals that ease friction damage on start-up and break-in. “Royal Purple tastes like grape drank”- Uhhh, I’ll take your word for it. Let’s get to work. 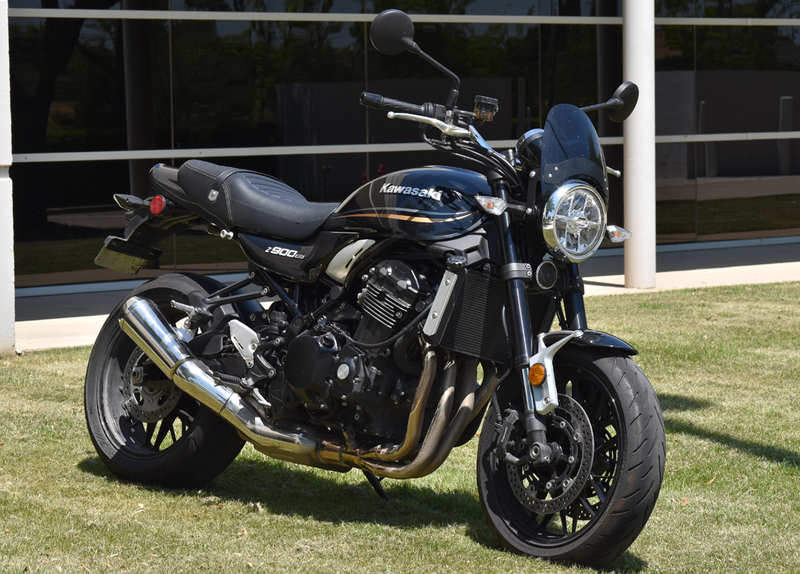 Whether you have never done an oil change or just need a refresher, let’s go step by step on a full synthetic oil change with this 2017 Kawasaki Z900RS. Start with a warm motorcycle. 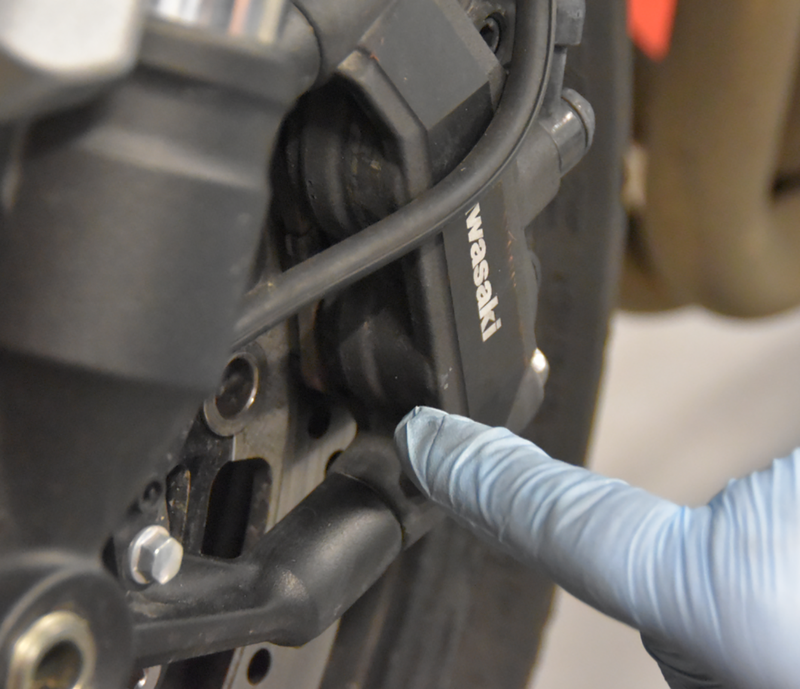 Letting the motorcycle get up to temperature will get the oil to its thinnest viscosity. We want to do this to ensure that all oil is moved and falls to the bottom of the engine. Shut the engine off and wait for roughly five minutes. This will allow the oil to fall to the bottom of the motor and to also help keep you from burning yourself. If you do not have a lift, make your life easier and use a bike stand. 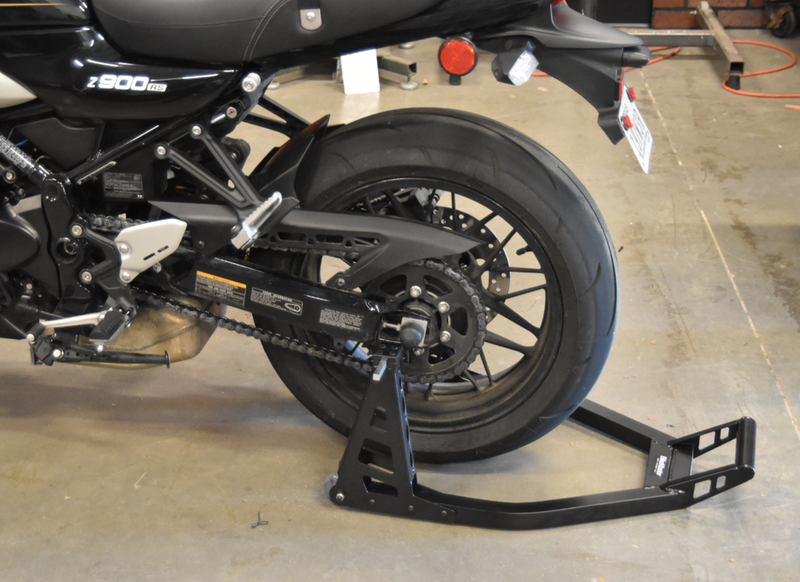 A bike stand will lift your motorcycle straight up and down and get it off of the kickstand. This will help get an accurate read on oil height and make quick work of various maintenance routines. Bikemaster stands are effective and affordable. Gather your tools and materials. 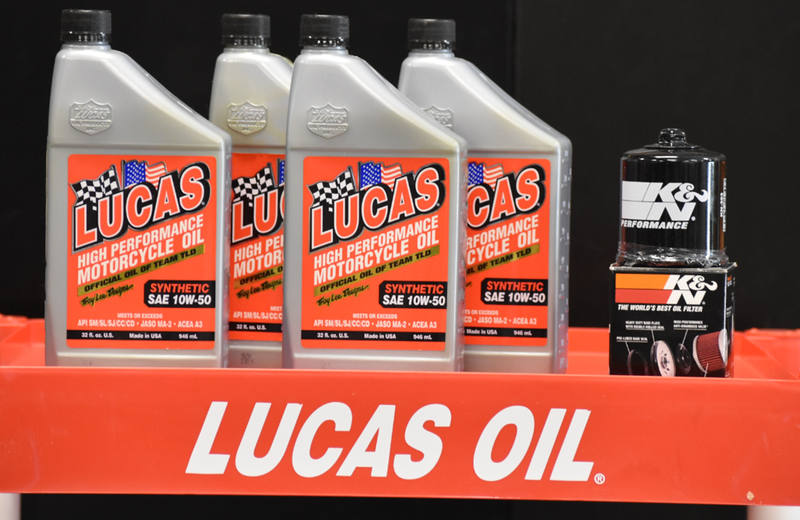 For this we will be using four quarts of Lucas Oil 10w-50 Synthetic and a K&N filter. 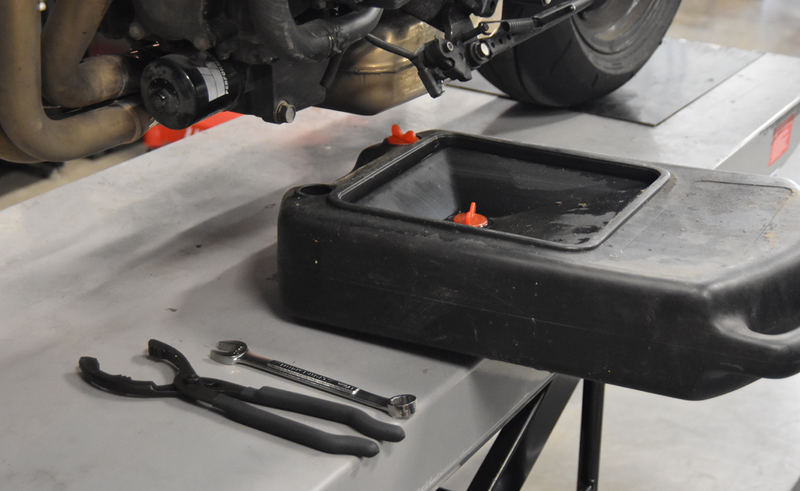 We will also be using a 17mm wrench, oil filter wrench and an oil catch pan. Clean off any area that could cause contaminants. 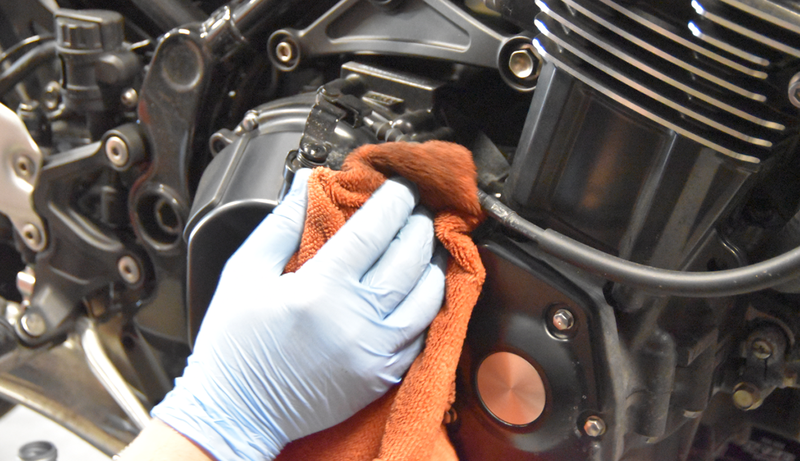 This is taking an extra step, but if you have a dirty bike, we don’t want any of that grime to get inside your engine. Let’s get that old oil out. 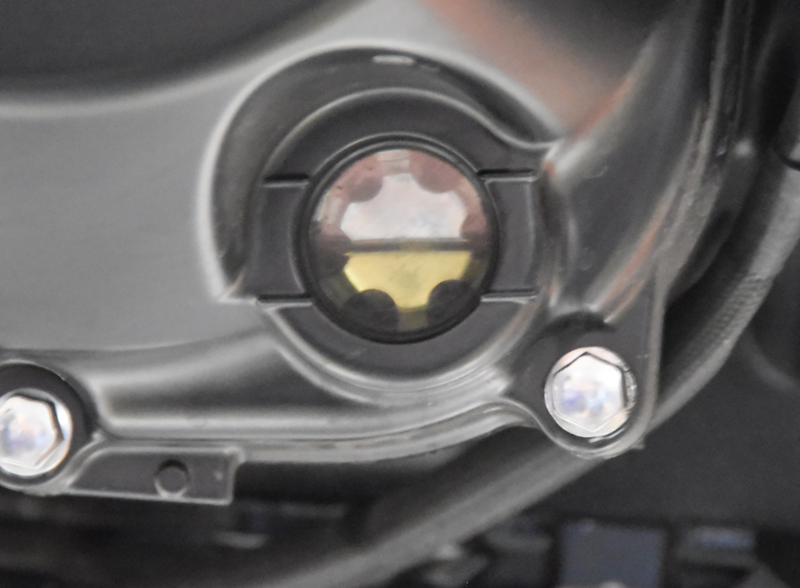 First, locate and remove the oil fill plug. Now let’s locate the oil drain plug and oil filter. 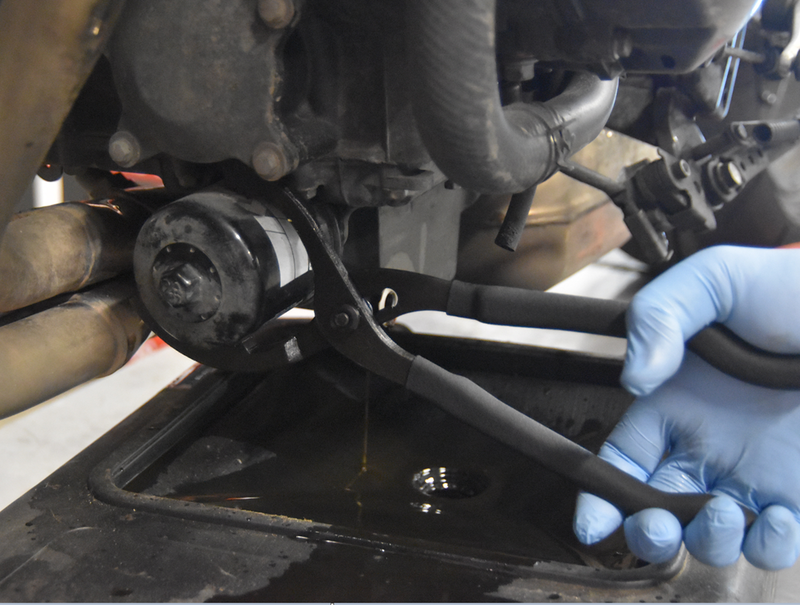 With the oil pan in place and using the 17mm wrench, remove the oil drain plug bolt. 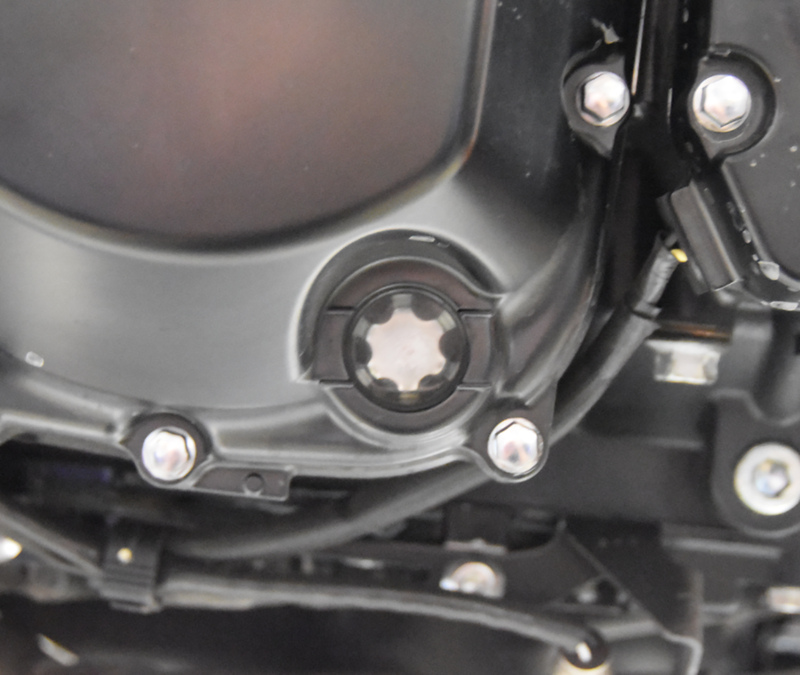 Depending on your oil filter, use your oil filter wrench or 17mm nut (K&N, Hiflo filters) and unscrew. Let oil drain completely until flow/trickle stops. 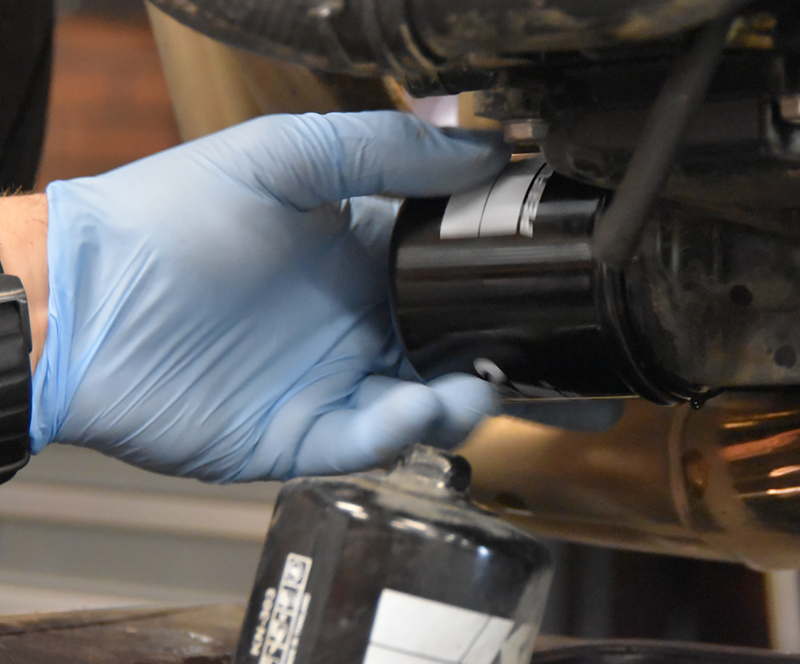 Prep your new oil filter. 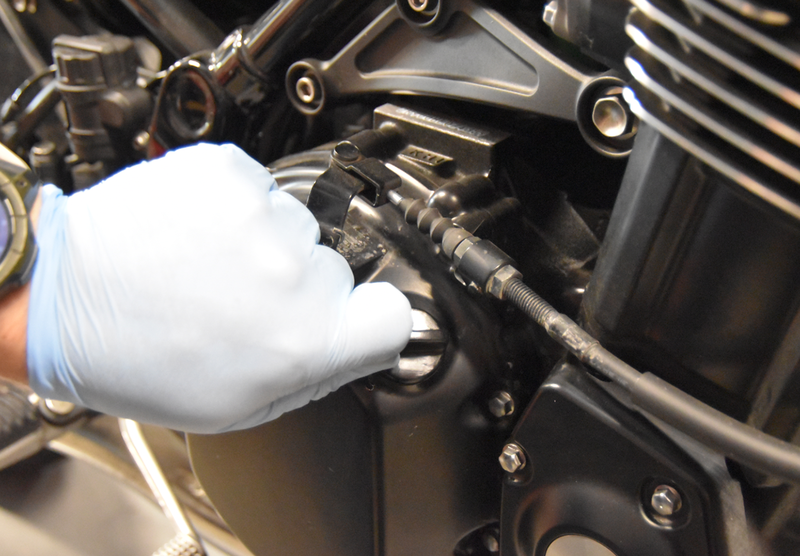 Using your index finger, use some of the new oil to wipe around the o-ring to help form a proper seal. Install the oil filter by threading back on. It is very important to not over tighten. 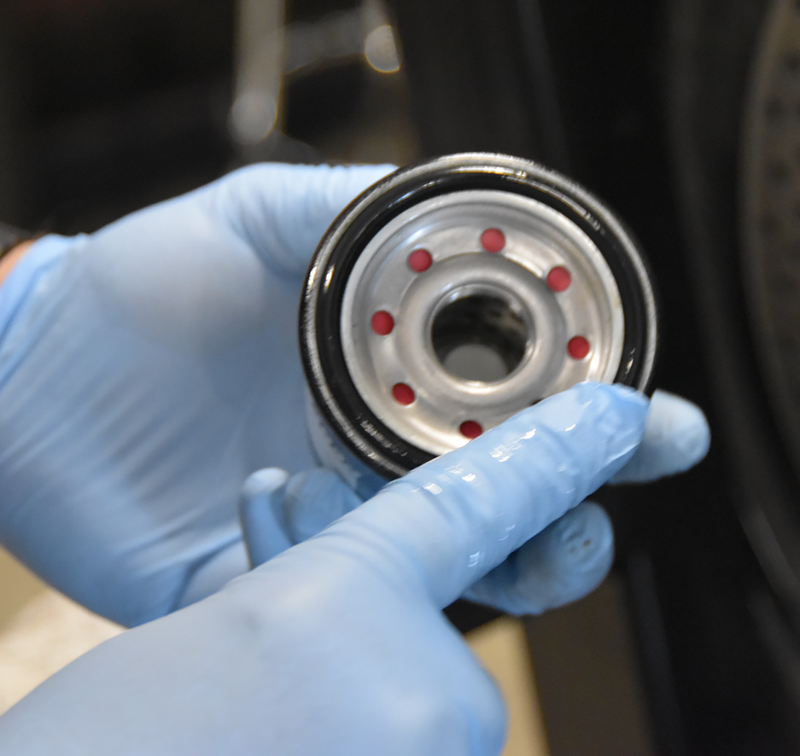 Over tightening could cause pressure issues, which could lead to further engine damage. As tight as you can spin on with your hands + ½ turn is all you need. 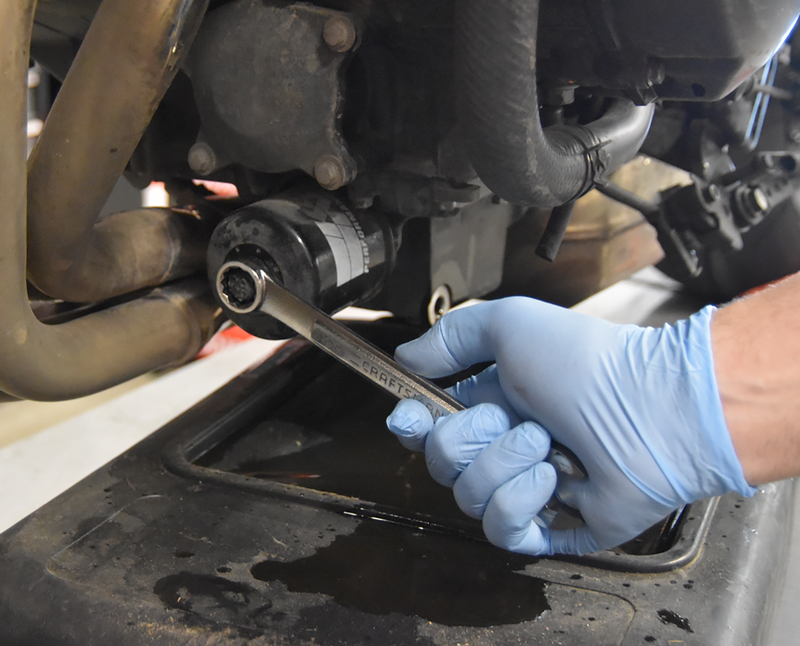 Reinstall your oil drain plug. 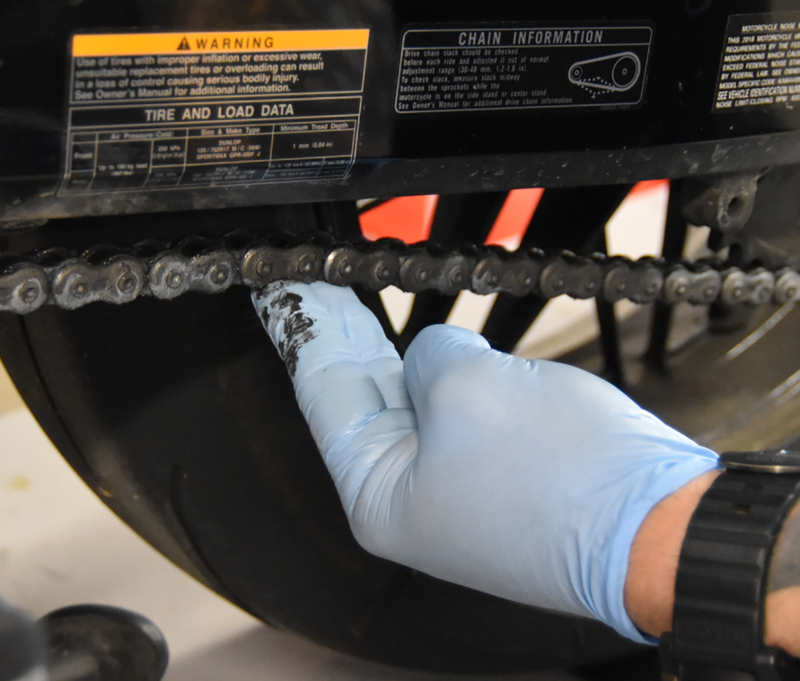 Now is a good time to inspect and clean it. Some plugs have a magnet to catch any metal particulates. If you see it, remove it. 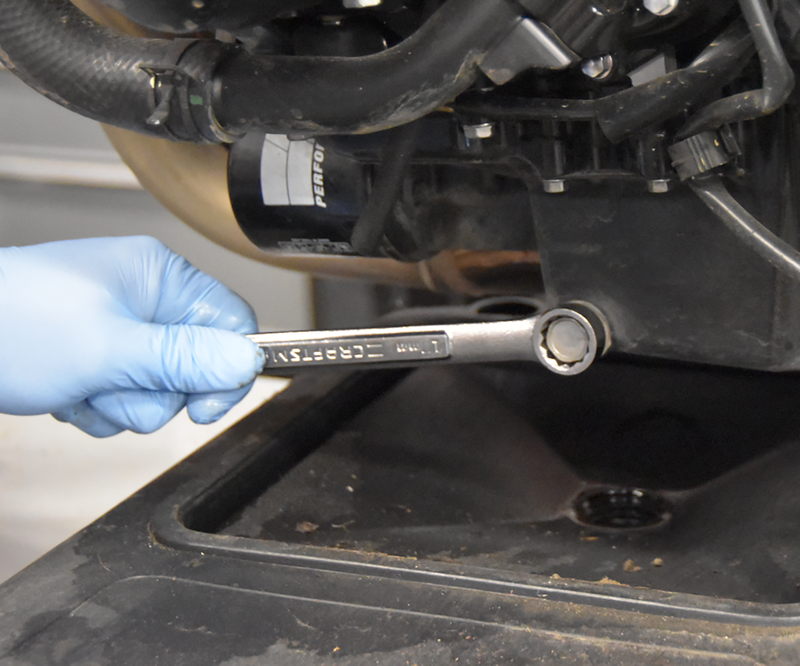 Torque down to 20Nm / 15 ft-lb (refer to your service manual for torque specs). Congratulations. You are half-way there! With a clean funnel, carefully start adding your first quart of oil into the oil fill. More than likely your sight glass (or dipstick) will start to read with a healthy level. Don’t be fooled as your engine has not sucked up any oil to the top end yet. This is an incomplete reading. 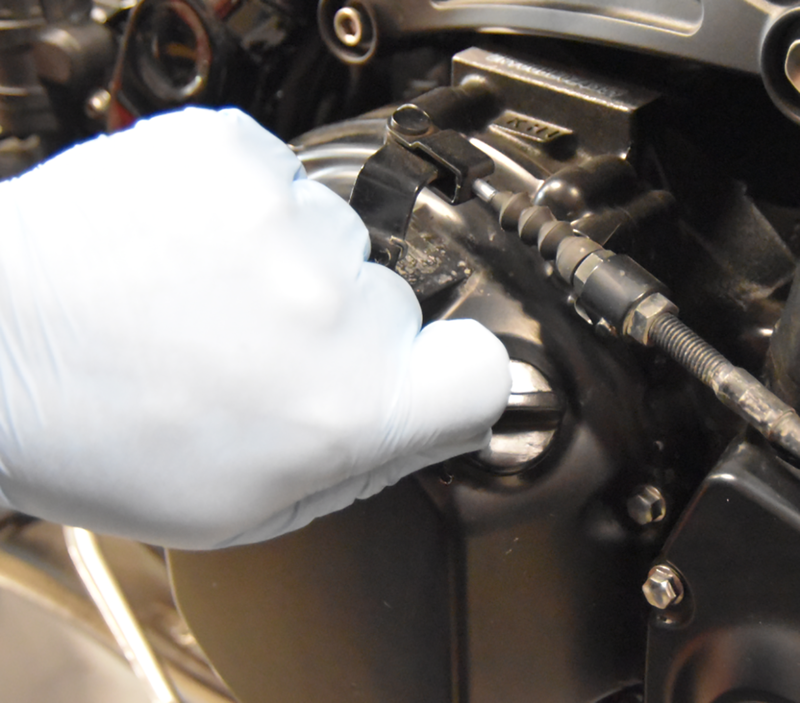 Install and tighten your oil fill plug and head up towards the ignition. We want to turn the bike on and let it get back up to operating temperature. 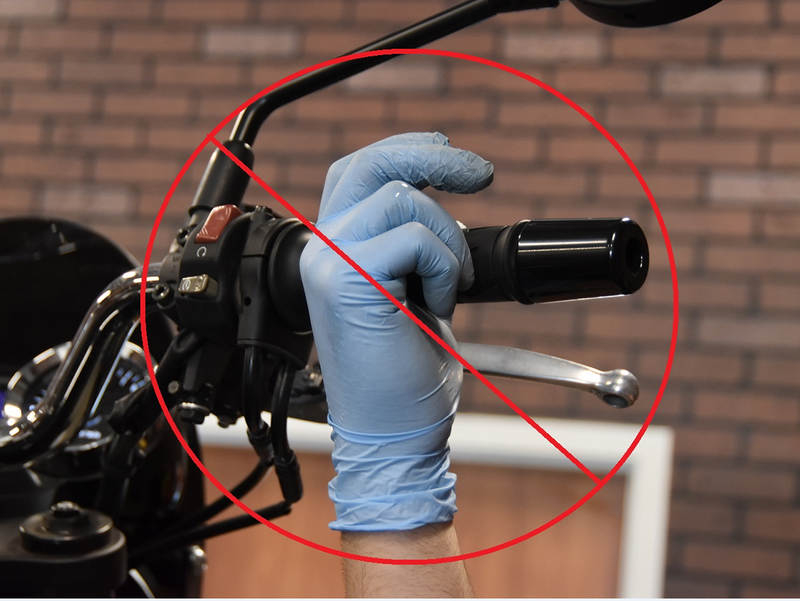 **Do not twist the throttle** To avoid any damage, we do not want to start revving the motorcycle as it does not have the fully required oil level. Once up to temperature, shut the bike off and hang tight for five more minutes. 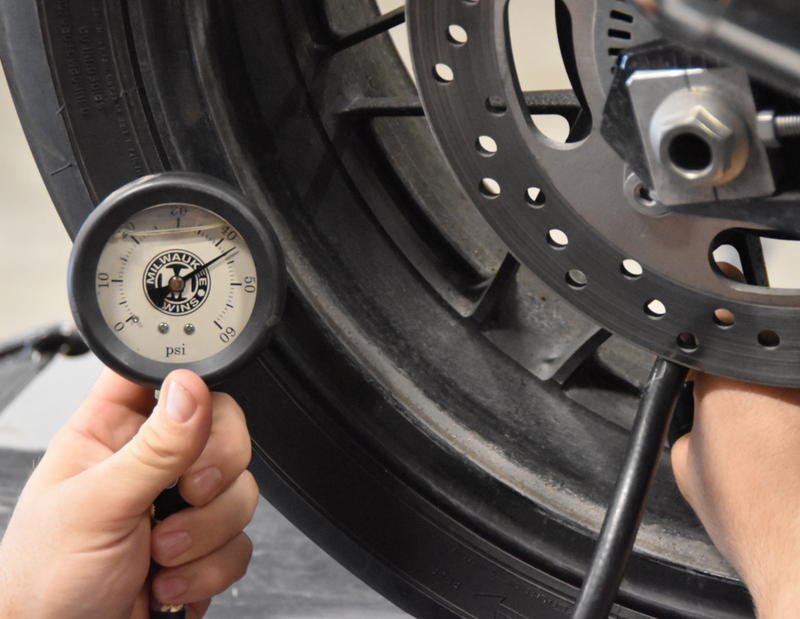 While you wait, this is a great time to do some visual inspections on your brakes, tires, air pressure and chain. Check for any oil leaks. Go back to your sight glass or dipstick. Check it and see that there is nothing in it or very low. Slowly start to add oil from your fourth quart. Odds are, you are likely to use only half of it. Top off using the fourth quart until you see the oil level start to rise. Stop when you have reached the desired level (refer to your owner’s manual). **Do not add the last quart of oil on your side stand** It will never show and you will likely end up over filling causing more harm than good. Secure your oil fill plug. Go ride, job well done. 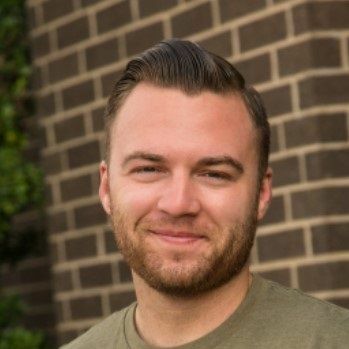 Bryan "Danger" is a marketing specialist & sportbike content producer. 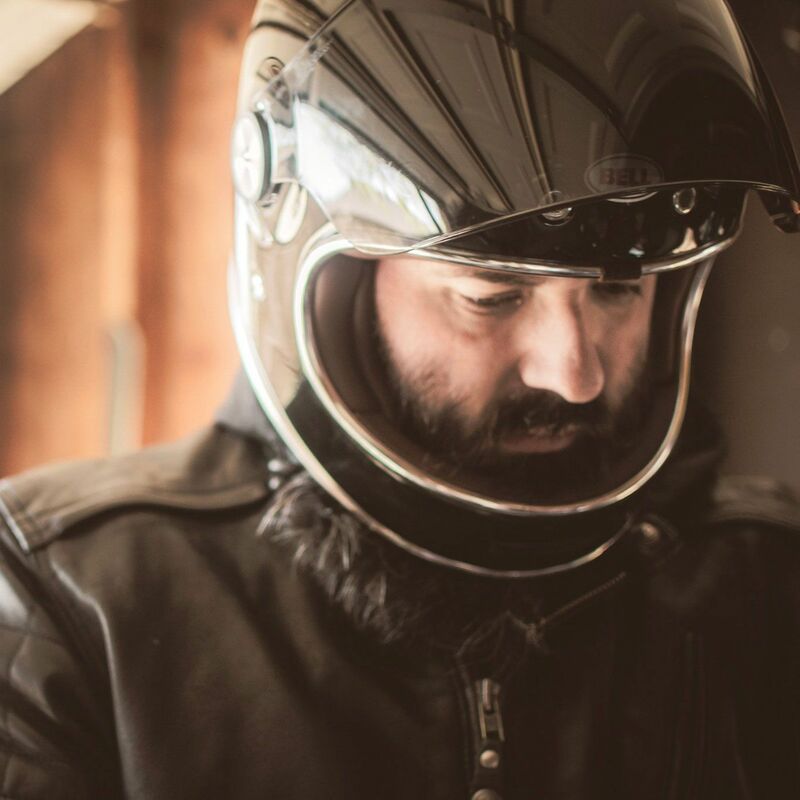 An accomplished racer, Bryan has competed in AMA Road Racing, Supermoto, Drag Racing, and GNCC. "Brakes only slow you down"